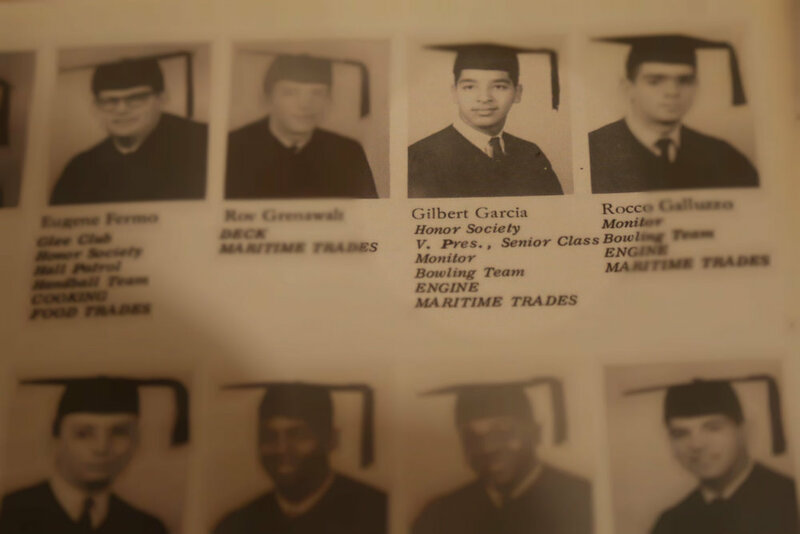 This blog was written by Gil Garcia, one of the alumni of the SS JOHN W BROWN, class of 1964. The Brown was launched on Labor Day, September 7, 1942, at the Bethlehem-Fairfield shipyard located in Baltimore Maryland. Of the 2710 Liberty ships built during World War 2, only two remain operational. The Brown is the only one the East coast. After thirteen voyages, in the maritime service during World War 2, the ship was loaned to the NYC Board of Education by the Maritime Administration. It was the only floating maritime high school in the country, with the mission of preparing young men for careers in the Merchant Marine service. The Brown served as a school ship from 1946 to 1982. It was affiliated with Metropolitan Vocational High School until 1961, Food & Maritime Vocational High School until the late 1970s, and Park West Vocational High School until 1982. You can imagine my excitement, when in September 1961, I reported aboard as a sophomore student, at the age of 15 years old. For most of the students, this was their first venture outside of the neighborhoods where they received their elementary education. We got to meet other students from throughout New York City including such far away places as Long Island and Staten Island. For a young man, what a great toy this was. We had a World War 2 ship to explore. We wore our uniforms as a badge of honor. There was no fooling around on the ship. Our instructors, most of them having served in the Merchant Service, treated and expected us to act like grown men. While on board the ship, our actions could get us hurt or hurt our fellow classmates. After a six month indoctrination where we all learned to go aloft, go over the side, learn our basic knots and shipboard procedures, we were assigned to our departments, being deck, engine or steward. I was an engineering student. 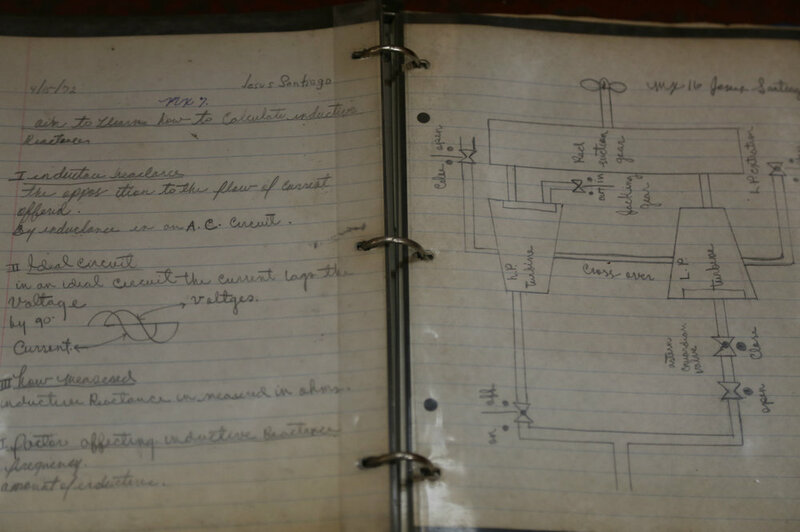 My course of study included pipefitting, machine shop, and electrical theory. In my junior year, I had to learn all of the ship’s mechanical systems, auxiliary equipment, and main engine. During my senior year I fired the boilers, operated the auxiliary steam equipment and the ship’s main engine. Having recently retired, after over forty years, as a licensed stationary engineer, I attribute much of the advancement and success in my trade due to the ideals and fundamentals I learned while I was a student on the school ship. All of our alumni members firmly believe that the Brown and our instructors were instrumental in our developmental growth and successes. As students, we would sit at the fantail where we shared our growing up stories, along with a smoke and coke break which we earned from our instructors. We often spoke and dreamed of what we would do if we were given the opportunity to sail the Brown out of New York harbor. Never in my lifetime would I have imagined I would be “living the dream” so many years later, when as a crew member of Project Liberty Ship, I stood on the fantail of my school ship admiring her wake and feeling the turn of her propeller under my feet. Project Liberty Ship originated in 1978 to preserve the ship as a memorial to the men and women that built the ships, and the merchant seamen and armed guards who sailed them. In July 1983, the Brown was towed from New York harbor to the James River Reserve fleet. In 1988, Project Liberty Ship started the restoration of the Brown. The first Living History cruise was held on the Chesapeake Bay in 1991. This year will be the Brown's 75 birthday. She has sailed the eastern seaboard from Windsor, Ontario to Jacksonville, Florida. Please visit the Project Liberty Ship and Alumni Association websites. Thank you for reading my story and that of many of my classmates. Prior to becoming a historic ship in Baltimore, the Liberty ship JOHN W. BROWN was moored in New York and served the city’s Board of Education as a vocational high school. Students came to the ship and learned the skills needed for a maritime career. The ship filled that role for 35 years, from 1946 to 1982. Now as an operating historic ship in Baltimore, JOHN W. BROWN continues to be an educational resource for a variety of local organizations. Several different groups conduct training on the BROWN. Local first responders (police, SWAT, EMTs, K-9 teams) train aboard the ship to gain experience working in a realistic shipboard environment which they may encounter in the Baltimore and Annapolis areas. Local maritime schools, operated by two of the major maritime unions, bring students to the ship when the class room training can be enhanced by doing a portion of the course aboard an operational ship. JOHN W. BROWN offers STEM internships to local high school students enrolled in that curriculum. Those students get a close look at some of the science, technology, and engineering found in the engine room of an operating steam ship. Classes from local schools, including the Naval Academy, tour the ship to learn about World War-II merchant marine operations and shipbuilding. However, one of the most important training programs on the BROWN addresses the needs of our own volunteers. The Liberty ship steam plant is an old design, no longer found operating elsewhere. The only place to train our volunteers to operate the engineering plant is right here on the ship. A formal training course was prepared and approved by the Coast Guard so that we can instruct volunteers to be JOHN W. BROWN firemen/watertenders. These are the watchstanders that operate the ship’s boilers to produce the steam used by the main engine and the auxiliary machinery. Three volunteers are presently taking the fireman/watertender course. The course includes classroom training, demonstrations of practical knowledge of associated machinery and procedures, homework assignments, and a final exam. Completion of the course, along with having the requisite amount of sea service, enables the volunteer to gain a Coast Guard endorsement in their merchant marine credential as fireman/watertender without having to take a Coast Guard examination. The course was first approved by the Coast Guard in October 2012 and to date 10 volunteers have completed the course. In addition to being an operational historic ship, JOHN W. BROWN continues her role as a training facility. In this case, by training the firemen/watertenders who will operate the ship’s boilers in the future. This is the heart of the online store. Judy is one of our experts on packing & shipping. She handles most letters and requests that come in from our supporters. Pulling together the online store is a perfect example of the team work that is the crew of the JWB. There are so many different things that are part of any store and and we're lucky to have talented people with expertise to share. Setting something like this up, is a part-time to full time job for many large companies, but since we're all volunteers with full time jobs in many cases, it's taken a bit of time and teamwork. We are starting with a limited number of the items we have. We really wanted to have the store live and working through all the steps with fewer items was faster. Now that the store is running we will be adding inventory on a regular basis. One of the first things we'll add is the 2016 calendar! It's being printed as we write and as soon as we have copies in hand we'll list it for sale. We also have back copies; though you may not use them for the dates, they are still full of interesting information and fantastic photographs. We've already gotten some orders, and we are learning new things and setting up procedures for packing and sending orders. This is a great, fun learning experience. The Ship's Store is open during our Living History Cruises and is opened whenever we have company on board. The ship is a busy place and you can read about the different groups that use it in our other blogs. Since we are only open on Wednesdays and Saturdays, we want everyone to know that it could take a week or so, or it might take longer (like if we sell out of sizes and need to order more), so allow for 4-6 weeks for delivery. Also consider the fact that with winter coming, snowy days mean times when there might only be a handful of crew making it to the ship. We have over 30 regular weekly crew that drive to Baltimore from Pa, De and Va, so bad roads on top of a 90+minute drive to the ship = low numbers of crew members some weeks. Please enjoy this new addition to our organization, and let us know of other ways we can help get merchandise you want. Eventually, we will have more JWB merchandise and more merchant marine inventory online, including books, artwork and clothing (sweatshirts and collared shirts). Send us an email if there is something you are looking for specifically. Our first 25 orders will receive a free deck of JOHN W BROWN playing cards. Be excited with us! !